The best-selling legal skills textbook in the market, Legal Skills is the essential guide for law students, encompassing all the academic and practical skills in one manageable volume. It is an ideal text for students new to law, helping them make the transition from secondary education and giving them the skills they need to succeed from the beginning of their degree, through exams and assessments and into their future career. The first part covers 'Sources of Law' and includes information on finding and using legislation, ensuring an understanding of where the law comes from and how to use it. The second part covers 'Academic Legal Skills' and provides advice on general study and writing skills. This part also includes a section on referencing and avoiding plagiarism amongst a number of other chapters designed to help students through the different stages of the law degree. The third and final part is dedicated to 'Practical Legal Skills'; a section designed to help develop transferable skills in areas such as presentations and negotiations that will be highly valued by future employers. 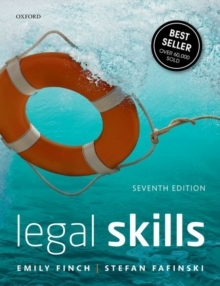 The text contains many useful features designed to support a truly practical and self-reflective approach to legal skills including self-test questions, diagrams and practical activities. Students are given the opportunity to take a 'hands on' approach to tackling a variety of legal skills from using cases to negotiation. Each skill is firmly set in its wider academic and professional context to encourage an integrated approach to the learning of legal skills. Online resources : -For lecturers, a bank of multiple choice questions and diagrams from the book -For students, answers to the self-test questions and practical exercises from the book and a glossary of all the keywords and terms used within the text. There is also an extensive range of videos with guidance on topics from what to expect from lectures and tutorials, how to research for essays and structure problem questions, to examples of good and bad practice in mooting and negotiations.